Foghorn Unscripted, Birmingham’s own improvised comedy group, present another feature length show – Absurdly Fabulous: The Improvised Episode, performed for one night only at mac’s Hexagon Theatre on Friday 29th September. Doors open at 7.30pm, with tickets priced at £8 (£6 concessions). For direct event info, including venue details and online ticket sales, click here. 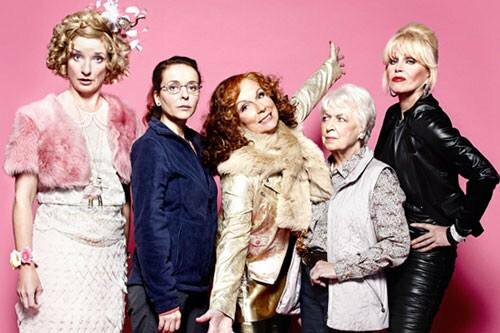 Billed as ‘the episode they never made’, the mac audience can expect a re-imagining of beloved 90s satirical sitcom Absolutely Fabulous (Ab Fab to its friends). Foghorn Unscripted, a group of local ‘improv’ comedians and professional actors established in 2011, bases all of its performances on audience suggestion and their own imaginations. Given the raucous nature of the source material, fans should no doubt prepare themselves for some silliness (and presumably, more audience participation than usual). It’s difficult, however, to imagine where Foghorn Unscripted may take the already established personas like Eddie and Patsy. Such familiar and favourite characters can be tricky to emulate, especially while bringing new laughs, and theatre productions such as this can depend as much on the audience’s appetite for absurdity as the actors’ talent. Having run for more than 20 years, first aired in 1992 (as well as a recent feature-length film released in 2016) Absolutely Fabulous’s catchphrases and jokes will need a fresh approach from Foghorn Unscripted. Like the TV programme, Absurdly Fabulous: The Improvised Episode promises to bring ‘debauchery, fashion and celebrity’. With a running time of 105 minutes, there’ll need to be some clever and surprising comedy to keep the audience on side. And for this lifelong Ab Fab fan, it’s fingers crossed that Foghorn Unscripted’s homage to Jennifer Saunders’ writing will be fittingly funny. Forghorn Unscripted present Absurdly Fabulous: The Improvised Episode – performed in mac’s Hexagon Theatre on Friday 29th September. For direct event info, including venue details and online ticket sales, click here.